If you’re impatient to get some color into your landscape, then the Higan Weeping Cherry tree is your best bet. This fast-growing ornamental tree quickly becomes a mid-sized specimen tree worthy of showcasing in your front yard landscaping. Bubblegum-pink flowers line the branches in spring, and although those frilly Cherry blossoms steal the show, the fall foliage is nice, too, hanging from the framework of branches like a golden cloak. You can give this weeping tree a neat haircut if you like, or you can let its willowy extensions brush the ground—in which case the kids are sure to discover the magical playspace underneath the canopy. A true beacon of spring! I don't know what more you could want to help you welcome spring each and every year. This beautiful weeping tree is just covered with double pink blossoms giving you the illusion of a pink waterfall in the garden! You just can't beat it - be sure to include one in your garden. Already have one? Why stop there? The more, the merrier! Weeping Flowering Cherry thrives in any sunny location in most types of soil, except those that stay wet. This is a grafted tree, so you’ll want to keep an eye out for suckers coming up from the base of the tree or growing straight up from the trunk—prune these out immediately. (Click here for the full scoop on pruning Weeping Cherries.) You’ll also want to watch out for Japanese beetles, which may chew on Weeping Cherry leaves in summer. They may be picked off by hand or controlled with chemicals or organic sprays. Please don’t hesitate to ask our tree care specialists here at Bower & Branch™ for advice on the pest control plan that works best for you! This is the first Spring that I have my Weeping Cherry Tree. What can I do or use to prepare it for the warmer weather after this snow is gone? Thank you for your question! For the very first Spring season of your Weeping Cherry Tree, our Growers recommend a couple of simple actions for providing care and ensuring health. Please plan to make an application of Bower & Branch Elements Fertilizer - follow the directions on the label for rates. However, I've also asked our Growers to share their personal use stories, what they do at home with their Trees! Apply the Elements as soon as the ground is exposed or workable. So right after the snow melts away, they make three holes around the base of the Tree about 12'' away from the stem. These holes are about 8-10'' deep and about the width of a candle (1/2'' wide and 8'' deep) - a simple screw driver can be used to create these holes. Then pour in the Elements, filling each hole - this brings the living product right in touch with the roots which is what is desired. Cover the hole with soil or mulch and let nature do the rest! Repeat this effort in the Fall as well! Pruning - AFTER flowering or right near the end of it, our Growers prune Weeping Cherries of all selections & sizes. The timing allows for being able to see branches well before leaf break. Not a lot of pruning is required but you can expect to see a blast of new growth to take place as a result. 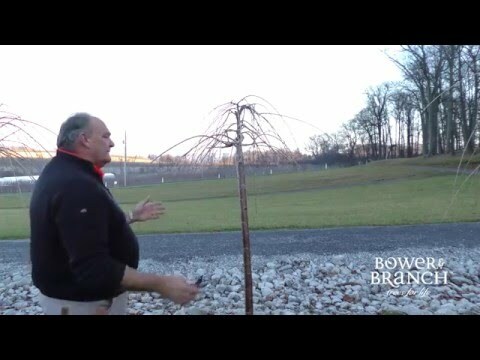 Please read this article: How to Prune a Weeping Cherry Tree or watch this video on Pruning Weeping Cherries - the same principle applies for both high and low forms. If you have any other questions - please don't hesitate to let us know! Happy Spring! 6-8' tall. The traditional high grafted Weeping Cherry grown in our #15 tree container with stem caliper above 1 1/2" in this size. Full and wide weeping canopy. 8' Tall and 6' wide. The traditional weeping cherry grown in our #25 tree container with a large stem caliper over 2" full and extremely wide weeping canopy.